A mystery do-gooder who has been leaving large, generous tips at eateries and bars throughout the country stopped by at least two San Francisco restaurants in the past two months. 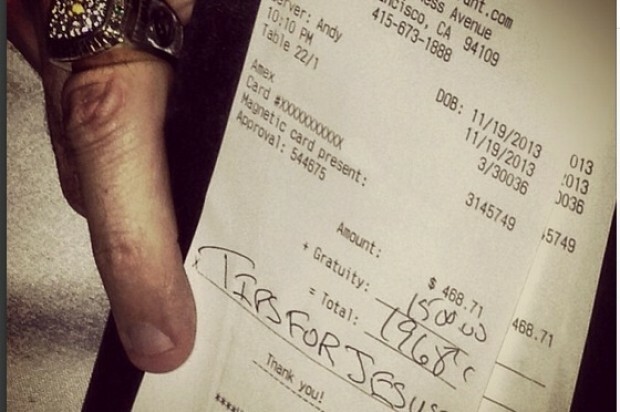 The mystery tipper has been signing bills with the social media handle @tipsforjesus, and has an Instagram page at #tipsforjesus filled with pictures showing the hefty gratuity on receipts. On Nov. 19, a $1,500 tip was left on a $468 bill at the steakhouse Harris’ Steakhouse, located at 2100 Van Ness Ave.
General manager Michael Fiscus said two men left the large tip and when a restaurant manager doubled checked about the amount, the pair said it was intended and didn’t offer further explanation or reasoning. “It seemed to be a moment of altruism,” Fiscus said. An employee at the Tacolicious location on Valencia Street said there was chatter among staff that the “Tips for Jesus” team had made a stop at the taco restaurant’s Marina District location as well. 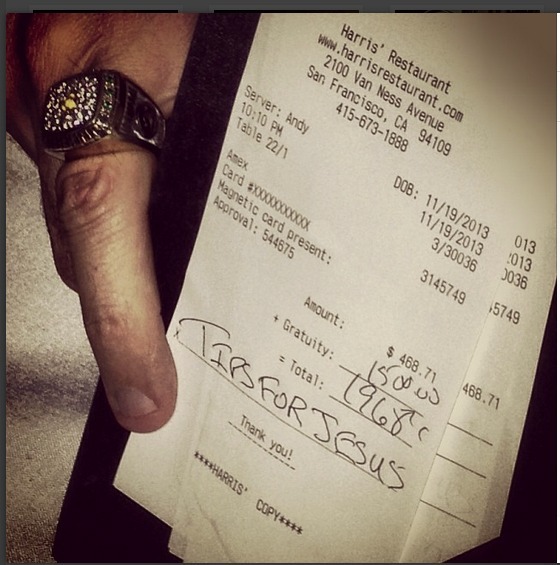 A photograph showing a $152 bill with a $1,000 tip from the restaurant at 2031 Chestnut St. was posted online on Oct. 9. The high tipper has visited businesses in other cities, including Los Angeles, Chicago and Seattle.